The ear lobe is thin and it is easy for the burglar to cut. The lock that you use should not be too big and loose. It should fit tightly as shown in the picture. I shall explain the reson why. This is the ideal ear lobe which is thicker than the one above. 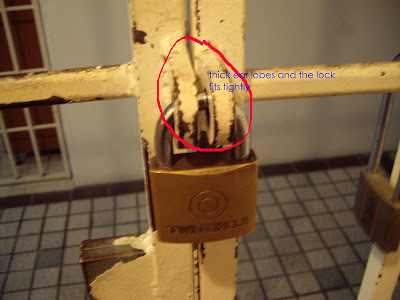 If the lock fits tightly , it may make it more difficult for the burglar to break loose the ear lobe from the grill because he has to break loose both the ear lobes from the grill. 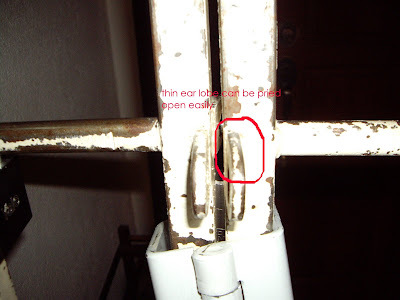 But, if the lock is big and it is loose, the potential burglar merely needs to break loose one of the ear lobes . 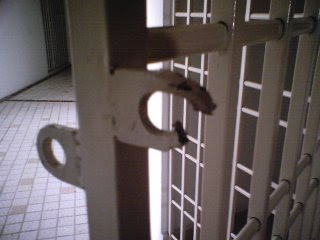 This type of lock will make it more difficult for the burglar to break in because he has to cut the lock or the grill . The above are some of the preventive measures that you can take to prevent your house from being broken into. 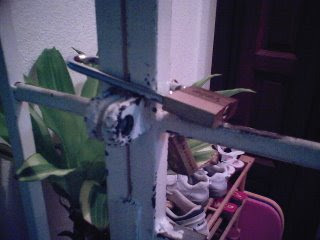 It is not a fool proof method but I guess, it will discourage the burglar from choosing your house as the target. 3. The PVDPMSB sources the quotations from various contractors. The JMC accepts any quotations from any owners or any committee member . We make sure there are 3 quotations to choose from before we make a decision in a JMC meeting. 4. With the advice of PVDPMSB and after a brainstorming the JMC selects the quotation in a JMC meeting. 5. PVDPMSB issues the PR ( Pre- Requisition ) form to be signed by the JMC. 8. When the job is completed, an invoice is presented to the account department of PVDPMSB. As for contractual services like the security and cleaning, the payment sums are fixed and the cheques are made in favour of the companies. It's the same for payments made for utilities. We had a meeting with the lift engineer, Mr Khoo from Eita Sdn Bhd this morning. We highlighted all our problems to him. Apparently, we told him that the lifts are not intelligent enough. The waiting time is too long. The ride is not smooth and there are some noises here and there. The speed is slow. He was quite concerned over our complaints and promised to look into them. According to him, the speed is already fixed and there is nothing you can do about it. 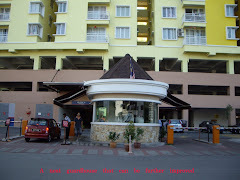 He further said that the lifespan of the lift is about ten to twenty years provided there is a routine maintenance. Our lifts are under monthly routine maintenance. They oil the parts, clean the lift pit and do some trouble shooting. At the moment , we don't have to pay anything for the routine maintenance as the lifts are still under liability for a period of 18 months. When the liability period is over, the JMC will have to make a decision whether to opt for comprehensive cover or non-comprehensive cover. For comprehensive cover, we have to pay about RM10 000 a month for the routine maintenance and for non comprehensive cover, it's half the amount. The difference is for the comprehensive cover, we don't have to pay anything for any replacement of lift parts. The JMC shall make a decision when the liability period is over. We don't really have a choice but to live with Eita lifts. To replace all the lifts with some Japanese brands may cost millions. The only thing that we can do is to put some pressure on the lift company to carry out proper routine maintenance of our lifts to cut down the frequency of breakdowns. I think they are committed to do so because it is a young company in the process of building up the Eita brand. We know that this umbrella sticks out like a sore thump at our condo. 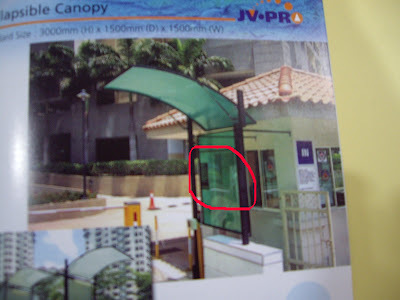 After cleaning up the guard house to make it look neat, do you really think that we will put a cheap umbrella there. You can rest assured that this thing will not be a permanent feature . It is only a temporary measure taken by us due to the unpredictable weather. We have a couple of options to solve the issue. The first option is to lenghten the roof so the motorists will not be affected by the rain. The cost to change the roof and the rotor arms is about RM 1400.00. This is the entrance. The exit is not affected by the rain if you use the lane beside the guardhouse. The second option is to install two canopies as shown in the picture above, one for the exit point and the other for the entrance. The total cost is about RM 4000.00. Based on the feedback from other condos which have installed these canopies, the motorists will still be affected when the rain comes with strong wind. Another one of our concerns is that the motorist is not able to communicate with the security guard due to the barrier as shown in the picture above. If we can disregard those two minor problems, we may go for the second option. We need your feedback on the issue. You are free to comment. The stains on the wall caused by the wheels of the motorbikes will be a thing of the past when the bricks are laid against the wall. When the job is completed , the wall will be given a new coat of paint. The whole job is done by our handymen so no extra cost is incurred. As for the bricks, they are partly sponsored by Mr Moh, our in-house renovation contractor.